(ISJM) The Jewish Community of Prague will host a conference dedicated to the life and work of the great thinker and rabbi, the Maharal of Prague (Judah Lowe Ben Bezalel) from September 7-9, 2009 to commemorate the 400th anniversary of the death of the learned and legendary Rabbi and community leader. The conference seeks to bring about a full discussion on such topics as the Prague Maharal’s role in the life of Ashkenazi Jewry at the beginning of the modern era, his position in the Jewish religious philosophy of his period, and the importance of his spiritual legacy to modern Jewish philosophy and life. This special event will be attended by internationally renowned experts across the rabbinic and academic world. The official languages of the conference will be English and Hebrew. The event is being organized in cooperation with the Department of Religious Affairs in the Diaspora (the Sochnut) and other institutions, including the Ariel University Center of Samaria, Charles University in Prague, the Federation of Jewish Communities in the Czech Republic and the Jewish Museum in Prague. (ISJM) The Holocaust-Era Assets Conference in Prague that began last Friday night is wrapped up today. In addition to enumerating continuing problems and reiterating positions, the Conference has produced a document (the Terezin Declaration) aimed at improving and perhaps speeding the restitution process for property seized during and after the Holocaust and never returned to direct or collective heirs. Forty-six participating countries signed the statement, if remains to be seen how many will follow through with its implementation. Like most such conference statements it is long on sentiments and short on details. The conference is certainty is good stimulus to the more than decade-long process of restitution negotiation, but it is a milepost only, not the final destination. I subsequent blogpost I will discuss some of the expert conclusions from the conference. These provide more detail and more specific recommendations on how to proceed. Different approaches are needed in different countries, and regarding different types of contested property. 1. Recognizing that Holocaust (Shoah) survivors and other victims of the Nazi regime and its collaborators suffered unprecedented physical and emotional trauma during their ordeal, the Participating States take note of the special social and medical needs of all survivors and strongly support both public and private efforts in their respective states to enable them to live in dignity with the necessary basic care that it implies. - Provenance research of Looted Art"
You can read the JTA report by Dinah Spritzer here. I was quoted in a preliminary article "Jews Hope to Reclaim Their Architectural Legacy in Eastern Europe," about the conference published in the Christian Science Monitor. My point about the reluctance of countries to restitution valuable urban properties, and their eagerness to dump dilapidated and neglected properties on Jewish communities is true, though the details of this issue are lost in my "soundbite" quote. In the past ten years there have been some successes, but these are few in relation to the actual number of restitution claims submitted by Jewish communities (not to mention by individuals). (ISJM) As work on the new Israel Museum facility in Jerusalem moves into its final phases, an ambitious new plan to reinvent and rename Tel Aviv's Beth Hatefusoth (Nahum Goldmann Museum of the Jewish Diaspora) has been announced. The preliminary concept for the museum - developed by curator Dr. Orit Shaham-Gover - was presented to the Board of Governors of Beth Hatefutsoth on June 26th. The $25 million project envisions an entire rebuilding and redesign of the existing museum structure. The museum, which in recent years has been beleaguered by organizational, financial and identity problems - will also change its name from the Museum of the Jewish Diaspora to the Museum of the Jewish People. For the first time in its history the museum appears to have rallied Israeli government support and international organizations and donors to sustain and expand its mission. When the museum opend in 1978 it was hailed as one of the most innovative history museums in the world, and was one of the first museums that was fully designed around a didactic mission, rather than a collecting one. Beth Hathfusoth pioneered many methods of using photo and later digital documentation to tell historical and ethnographic narratives, but beginning in the 1990s when a new wave of high-tech Jewish museums opened in America and Europe, many questioned Beth Hatefusoth’s ability to compete and to sustain relevancy. Throughout its history the museum has also struggled with its very identity. As a museum devoted to maintaining the history of Jews in the Diaspora its mission was at odds with the mainstream Israeli social, political and cultural agenda. The new plan and the new name are apparently designed to address and rectify these old problems. For more on the story see Schelly Talalay Dardashti's report on Tracing the Tribe. Baltimore's Lloyd Street Synagogue, built in 1845 as home to the Baltimore Hebrew Congregation, and now part of the Jewish Museum of Maryland, has received a 2009 Historic Preservation Award from Baltimore Heritage, inc., a citywide, nonprofit historic and architectural preservation organization. The Synagogue/Museum is in the midst of a restoration and renewal project. The first phase of restoration, which as been completed, included exterior painting; masonry, wood, and window repair; and roof replacement. Phase 2 will include the installation of a sprinkler and HVAC system, air conditioning. John Srygley of JRS Architects is the preservation architect working on the project. From an historical point of view, it is more interesting that the Museum is taking this opportunity to develop a new history exhibition in the downstairs area: The Synagogue Speaks, which will focus on each of the three immigrant congregations that occupied the building (Baltimore Hebrew Congregation, 1845-1889; St. John the Baptist Roman Catholic congregation, 1889 to 1905; and Shomrei Mishmeres, an East European shul, 1890-1905). A key feature of the exhibition will be an animated digital presentation showing the changes to the sanctuary through the years as the building changed from Orthodox to Reform Judaism, to Catholicism, and then back to Orthodox Judaism. The former synagogue will be closed to the public from June 23rd on. Visitors can still see the marvelous B'nai Israel Synagogue next door, and the video tour of the two synagogues. The Museum will be half priced during the renovation ($4 per adult, $2 per student, and $1 per child at 12 and under). 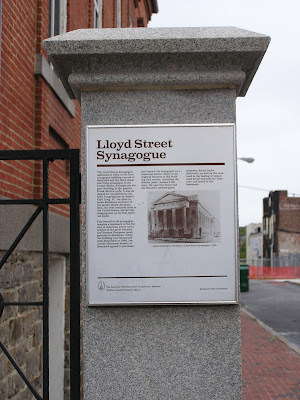 The Lloyd Street Synagogue is one of the most important in the United States both because of its age and architecture, but also because it varied history is representative of almost every phase of synagogue Judaism experience in America. 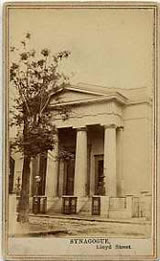 It is the third oldest standing synagogue building in the country (after Touro in Newport and Beth Elohim in Charleston), and its typical Greek Revival (ancient) Temple form, designed by leading Baltimore architect Robert Carey Long, Jr., has always been an exemplary expression of that important style American synagogue (and civic) architecture. But the building underwent many transformations, and these are significant, too. It was enlarged in 1860 (by architect William H. Reason), and remodeled c. 1873 several changes were made, including adding an organ and removing the central bimah. Presumably at this time the bimah was added to the Ark platform (duchan) in what was fast becoming the standard Reform practice. Both of these events reflected the congregation’s slow drift from Traditional (Orthodox) Judaism to Reform. Still later, in 1888, the synagogue was purchased and used as a church by the new Lithuanian Roman Catholic congregation, one of the first such transformations in the country (foreshadowing what would, after World War II, become a major trend). At Lloyd Street, however, the tables turned, and the Jews returned, and in 1905 the then-Church of St. John the Baptist was sold to the Eastern European Orthodox Shomrei Mishmeres Congregation, which established itself in the building, where it remained until 1963. Shmorei Mishmere also remodeled, and brought a taste of Poland (or at least Eastern Europe) to the sanctuary, which they decorated with wall paintings - some following the contemporary synagogue vogue for scenes of Eretz Yisrael. As if these transformations were not enough, fifty years ago the synagogue took on a new role as the home of the Jewish Museum of Maryland, and in the 1960s the building was radically "restored," - so that most of the accretions added by its different congregations were removed, but there was little knowing if what was recreated was really close or not to the original. Still, Lloyd Street is important as one of the first instances of a communal effort to protect and preserve an historic American synagogue. Between 1963 and 1965, the building was restored to what was believed to be its original appearance. The full story is told by Louis F. Cahn in The Restoration of the Lloyd Street Synagogue (Baltimore: Jewish Historical society of Maryland, 1973). Beginning in the 1990s, however, under the former Museum director Bernard Fishman, detailed studies of the building fabric, including paint studies and archaeological investigations, revealed that the 1960’s renovation had altered the building in ways that obscured many of its historic features. The Baltimore Hebrew Congregation was incorporated in 1830 and the synagogue on Lloyd and Water Streets was dedicated on September 26, 1845. A description of the dedication by Isaac Leeser published in The Occident (November 1845) mentions several building features that were deemed significant at the time. These include the Doric portico of the synagogue with “a flight of steps on each side” leading up to a gallery which ran on three sides. The original building was smaller than the present structure – it was extended by thirty feet in 1860 and presumably remodeled in ways we cannot now determine. The building was again substantially rebuilt on the inside and rededicated in 1871. Thus, though the first building which was bays long, was extended to six bays for a total of six tall windows on each side. “The main floor of the church is fitted up with pews, and has a gallery extending on three sides of the church appropriated entirely to the female portion of the congregation. The eastern wall has a round window filled with stained glass directly over the ark [cabinet containing the Torah]. The ark… is a semi-circular temple with Corinthian pillars and ribs, and carved ornaments on the roof and the tables of the law in front. The doors are enriched with carvings and slide on rollers around the curve of the sides. On each side of the ark is an elevated platform with rich finished arm chairs for the President and Vice President of the congregation. In front is the reading desk and seats for the readers, of solid walnut. The window over the ark bears [sic.] the shape of a double star, of the most beautiful variegated colors, illustrating the shield of David, in the centre of which is a representation of a Greecian [sic.] Corinthian Acanthus. The spaces between the points of the star are filled with Grecian leaves, the whole surrounded by a circle to correspond….The windows are tinted of a golden color and diffuse a warm glow of light in the interior. The interior wood work is painted of a warm drab color, and the walls and ceilings when dry are going to be finished in fresco.” (Baltimore American and Commercial Advertiser, September, 1845). The original Lloyd Street Synagogue Ark was, according to Leeser, “a semi-circle, reached by a flight of steps of the same form, on the plan of the Synagogues of New York.” Such an arrangement can be seen in the still-extant Ark at Beth Elohim in Charleston. The arrangement of 1845 was significantly altered when the building was extended by thirty feet in 1860, and a new east wall with ark was erected. At this time a full bimah was inserted in the synagogue near the new Ark, but not immediately in front of it. The bimah, here referred to as a raised desk, was described in a 1860 Baltimore American newspaper article: “Within the space left in the centre of the building, the desk, handsomely draped in purple velvet with bullion bordering, is raised. In front of the desk a number of semi-circular benches are placed for the accommodation of the choir, who face the ark and pulpit stand.” Click here for the entire article. Krakow, Poland. Top: Tempel Synagogue interior. Bottom: Matzevah of Moses Isserles (Remu). Photos: Samuel D. Gruber 1996, 2008). The 19th Annual Jewish Culture Festival in Krakow will be held form June 27th to July 5th, 2009. The full program can be consulted here. Over the past twenty years Ruth Ellen Gruber has written a lot about the annual Krakow Jewish Festival. On her blog, she looks ahead to this festival. The festival has grown, evolved, and matured in two decades. Growing from what was first described as an event "where Poles dressed up as Jews to entertain German tourists," the Festival has developed in to one of the most vibrant and popular showcases of Polish and International Jewish culture in Europe. Jews from Poland, surrounding countries, Israel and America have made the Festival a regular destination; and thousands of non-Jews are exposed every year to new, exciting, engaging aspects of Jewish culture. So may still perpetuate stereotypes, but most break them, but showing Jewish culture to both traditional and contemporary. Ruth writes that the "articles are beginning to appear in newspapers and online....click here for one in the Jerusalem Post. According to the Festival's web site, the Festival recently took first place in a survey on what is Krakow's best product for tourists." Besides being a active week for Jewish music, dance, art, lectures and happy schmoozing, the Festival is one of the best times to see Krakow's historic - and mostly restored - synagogues and other Jewish sites. 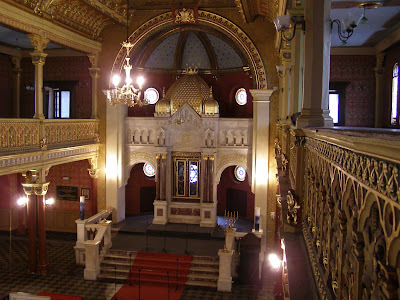 Concerts are held in the 19th-century Tempel and other synagogues. 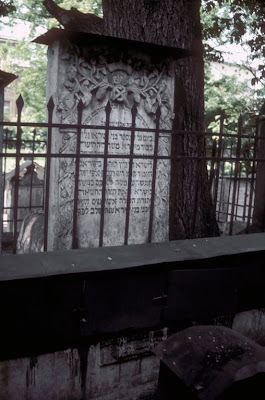 There are regular tours of the synagogues, and my good friend Rabbi Edgar Gluck, Chief Rabbi of Galicia will give a tour of the Remu Synagogue Cemetery on July 1st. Each year the Festival is bigger and bigger, so if you are planning on going, you should book your accommodation now. Kestenbaum & Company will conduct an auction of Fine Judaica on Thursday, June 25th at 3:00 pm. The sale will take place at the firm’s gallery in New York City and will feature the Library of the Late Dr. Max Kimche of Zurich. Besides Dr. Kimche’s collection of Important Hebrew Printed Books, the sale will also offer a fine selection of Manuscripts, Autograph Letters, Ceremonial and Graphic Art. Dr. Max Kimche (1907-1987), a lawyer and financier, was a highly respected member of Zurich’s legal and banking communities as well as a prominent member of Zurich’s Jewish community. His dedication to his faith and commitment to Jewish social-needs was manifested by his work on behalf of Holocaust survivors and his substantial support for Jewish Statehood. A direct descendent of Rabbi David Kimche (1160-1235), his devotion to scholarly Jewish learning is evident in the supreme collection of books he acquired over the course of three decades and now offered here for auction sale. The Kimche Library features singular Incunabula such as Moses of Coucy’s Sepher Mitzvoth Gadol, Soncino, 1488, at an estimate of $40,000-60,000 (lot 208), David Kimche’s Sepher HaShorashim, Naples, 1490, estimate $20,000-30,000 (lot 169), Joseph Albo’s Sepher Ha’Ikarim, Soncino, 1485, estimate $20,000-30,000 (lot 12), and Yedai’ah Bederso’s Bechinat Olam, Soncino, 1484, estimated at $20,000-25,000 (lot 51). Rare 16th century Hebrew Books comprise the heart of the Kimche Library. The cities of origin of these texts were some of the most notable locations for early Hebrew printing. Fine examples include Genoa: the first Polyglot Bible, 1516, estimate $10,000-15,000 (lot 59); Venice: a complete edition of the Mishnah with commentary by Maimonides, 1546-7, estimate $15,000-20,000 (lot 200); Augsburg: Jacob Ben Asher’s Arba’ah Turim, 1540, estimate $15,000-20,000 (lot 151); Riva di Trento: A deluxe copy printed entirely on blue paper of Jacob Ben Asher’s Arba’ah Turim, 1560, estimate $10,000-15,000 (lot 152); Pesaro: Midrash Chamesh Megiloth, 1519, estimate $12,000-15,000 (lot 194), Don Isaac Abrabanel’s Perush Nevi’im Rishonim, 1511, estimate $7,000-9,000 (lot 2) and Abrabanel’s Perush Nevi’im Achronim, 1520, estimate $7,000-9,000 (lot 3); Constantinople: Abraham Ben Nathan of Lunel’s Sepher Hamanhig, 1519, estimate $7,000-9,000 (lot 6); Rimini: Bachiah Ben Asher’s Biur al HaTorah, 1524-26, estimate $6,000-9,000 (lot 47) and Fano: Jonah Gerondi’s Sha’arei Teshuvah, 1505, estimate $20,000-25,000 (lot 124) and Judah Halevi’s Sepher HaKuzari, 1506, at an estimate of $20,000-25,000 (lot 131). Hebrew Books published by the renowned Venetian printer Daniel Bomberg include Isaac Ben Jacob Alfasi’s Sepher Halachoth Rav Alfas, 1521-22, estimate $20,000-30,000 (lot 13); a selection of Babylonian Talmud Tractates such as Masecheth Yevamoth, 1522, estimated at $30,000-40,000 (lot 247) and the first two Biblia Rabbinica: The first from 1516-17, estimate $20,000-30,000 (lot 62) and the second 1524-25, at an estimate of $10,000-15,000 (lot 60). Also featured in the Kimche Collection are Kabbalistic works such as Shimon bar Yochai’s Sepher HaZohar, Mantua, 1558-60, estimate $10,000-15,000 (lot 232) and Sepher Yetzirah, Mantua, 1562, estimated at $7,000-9,000 (lot 165). Both of these mystical texts are first editions. Other books of note include Johannes Reuchlin’s De Arte Cabalistica, Hagenau, 1517, estimate $5,000-7,000 (lot 224); Johann Caspar Ulrich’s chronicle of Jewish life in Switzerland from the 13th century until the 18th century, Basle, 1768, estimate $3,000-4,000 (lot 243) and Theodor Herzl’s Medinat HaYehudim, the first Hebrew edition of “Der Judenstaat”, Warsaw, 1896, at an estimate of $2,000-3,000 (lot 259). In addition to the Kimche Collection there are many good items of Americana, Illustrated Books, Manuscripts, Zionist and Holocaust-related material. Within the American Judaica section are two Parlimentary Acts relating to civil rights for the Jewish communities of Jamaica and Barbados in the year 1832 (lots 15 and 16). Among the Illustrated Books, highlights include Bernard Picart’s three volume visual Description of the Religious Duties, Manners and Customs of all the Nations of the World, Amsterdam, 1727-38, estimate $4,000-6,000 (lot 270); Max Liebermann’s Der Rabbi von Bacherach, Berlin, 1923, estimate $1,200-1,800 (lot 269); Joseph Budko’s Der Rabbi von Bacherach, Berlin, 1921, estimate $700-1,000 (lot 263) and Abel Pann’s illustrated Five Books of Moses inscribed to Maestro Leonard Bernstein from the Palestine (Eretz-Israel) Philharmonic Orchestra, May, 1947, estimate $200-300 (lot 261). 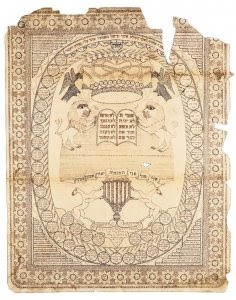 Interesting selections among the Manuscripts include an illuminated micrographic Sephirath Ha’Omer Chart by David Cohen, Portland, Oregon, 1883, estimate $10,000-15,000 (lot 283); a religious Hebrew guide to funeral rites for the Jews of Jamaica, Kingston, 1868, estimate $5,000-7,000 (lot 282) and a Brazilian Ketubah (Marriage Contract), Bahia, 1844, uniting Grazia Levi and Isaac Amzalak, a Portuguese Jew who played a pivotal role in the Brazilian Jewish Community, estimate $4,000-6,000 (lot 284). Autograph Letters of note include correspondence by David Ben-Gurion, Moshe Dayan and Yitzhak Rabin. Also noteworthy is a framed photographic portrait of Albert Einstein, signed and inscribed by him, Los Angeles, 1932, estimate $6,000-7,000 (lot 299) and a German Administrative Order to enforce punitive labor in the Plaszow Concentration Camp, October, 1943 at an estimate of $2,000-3,000 (lot 301). The Graphic Art section features Sol Nodel’s Book of Grace with 12 illuminated panels of the Hebrew Birchat Hamazon, circa 1968, estimate $7,000-9,000 (lot 322); Janssonius’ exceptionally large Map of the Holy Land, 1658, estimate $5,000-7,000 (lot 319) and a group of drawings and etchings by Issachar Baer Ryback and Hermann Struck. The sale concludes with a small selection of Antique Ceremonial Art. The entire catalog can be viewed online here. top illustration: Cohen, David. Sephirath Ha'Omer [Chart for Counting of the Omer]. Multicolor Micrography. Red, blue and brown sepia inks on paper. At top Tetragrammaton; below ornate crown borne aloft by two eagles; below Decalogue flanked by lions; below seven-branched Menorah, flanked by two harts; flower motif surrounds entire chart. All amidst dense Hebrew inscriptions. At the base of the Menorah reads in Hebrew: "This Holy Work was Completed on the 23rd of the Month of Adar Sheini in the Year 1883, Here in Portland, by David Cohen." Chipped, lacking portions from top and right margin, fragile. 22 x 28 inches. [Israel Museum Catalogue: Micrography as Art (1981), pl. 89; Jewish Museum Catalogue, Jewish Heritage in American Folk Art (1984) pp. 79-80, nos. 60-62]. (ISJM) As reported last month, the Conference on Holocaust-Era Assets will convene this weekend in Prague. Delegations from several dozen countries and many NGOs will participate. The schedule for the conference, including the working group sessions have been posted. Working Groups (WG) are composed of representatives of institutions with fundamental activities, field experience and research results related to the principal topics of the WG agenda. - draft recommendation for the final declaration. Swampscott, Massachusetts. Sanctuary and social hall of former Temple Israel as they look today. The seats are not original. the Ark has been removed, as well was two large menorahs formerly situated on the bimah about where the trees are seen. Photos: Susan Solomon. (ISJM) The future of the former Temple Israel synagogue at 837 Humphrey Street, in Swampscott, Massachusetts, the first of five synagogues designed by renowned modernist architect Pietro Belluschi is in limbo again. The synagogue, designed and built form 1953 to 1956, is one of a group of early post-World War II synagogues that combined simple geometries and expressive forms, animated by the abundant and sometimes directed use of natural light. Belluschi’s designs, like those of Erich Mendelsohn and Percival Goodman introduced a new vocabulary of forms and materials into synagogue architecture. The Town of Swampscott, which purchased the building from the congregation, which moved and merge with another, in 2006, published a RFP (Request for Proposals) today, indicating it has given up on attempted to adapt the 1953 structure for town use. There has been strong indication that building would be used as the town police headquarters, with the impressive sanctuary space preserved as a public meeting and cultural space. Now, the RFP calls for proposals to convert the 52,000 square foot synagogue complex for residential use. There are design guidelines in place, but I was unable to obtain these from afar. Most likely, any reuse will maintain the essential mass and profile of the building – which is distinctive because of the large raised drum and dome of the sanctuary, but it is doubtful that sanctuary space would remain intact in a residential conversion. The reuse report commissioned by the town in 2007 from Reinhardt Associates, Inc. explores several options including residential use. You can read the Reuse Report here. The report found the building to be an ideal candidate for renovation. The site was found to be free of hazardous material, and the costs of demolition and new development on site exceeded adaptive reuse costs. The Committee overseeing the project found that renovation of the building “is feasible and cost effective. The best use for the building is for police department headquarters, the space requirements of which fit efficiently in the lower level of the facility. The upper floor levels have the benefit of additional usable space for a community center or a cultural arts center or other Town approved uses.” I do not know what has changed in the situation in Swampscott that has derailed the transition to police headquarters. It may just be that in this distressed economy the town has not funds to proceed, and carrying the empty building is, meanwhile, to great a drain on its resources. Temple Israel is one of the many religious buildings designed by Italian-born architect Pietro Belluschi (1899- 1994), who moved to the United States in 1922. He soon afterward began to practice architecture in Portland, Oregon, where he established a leading reputation in both commercial and religious architecture through 1951, when he moved to Massachusetts as Dean of Architecture and Planning at MIT in Cambridge. While Belluschi’s commercial work is identifiable by his preference of a tightly organized grid structure, in the tradition of Italian rationalism, as in the widely-acclaimed the Equitable Building of Portland (1945-48), his religious buildings are very different. His many religious buildings , including five synagogues, are well documented in Meredith Clausen’s book Spiritual Space: The Religious Architecture of Pietro Belluschi (Seattle: Univ. of Washington Press, 1992). At Temple Israel, where Carl Koch & Associates were project architects, Belluschi utilized for the main synagogue facility an existing substructure that had bee begun and then abandoned for another synagogue, and adjacent to this he built a well-lit domed hexagonal space for the sanctuary – an idea, according to Clausen – first broached by Koch. "The results were new in Belluschi’s work but reflect his personal, rationalized approach to architectural design, with an explicit structural framework of steel and laminated wood beams, richly textured brickwork, and stained redwood. Simple in form, monumental in aspect, yet human in scale, with visual appeal derived from the skillful use of straightforward brick, wood, and stained glass in lieu of applied decoration, Temple Israel exerts a quiet distinction appropriate for its place and purpose." Abundant natural light fills the sanctuary from the large glazed sides of the 40 foot high drum. Variants of this design were then developed in Belluschi’s synagogue in Merion, Pennsylvania (Temple Adath Israel) and most successfully at Temple B’rith Kodesh in Rochester, New York. For the most part, these synagogues, like Belluschi’s churches, adapt vernacular and traditional motifs to create comfortable, warm and well-lit community spaces. In contrast to his commercial architecture, Belluschi’s religious buildings look natural and low-tech while still imparting a feel of serene and sometimes even soaring majesty. Philip Carmel, International Relations Director of the Conference of European Rabbis (CER) and Executive Director of the Lo Tishcach Foundation announced today that on Sunday June 21, “all of the bones removed from the medieval cemetery in Toledo were reburied in the actual graves from which they had been removed. This was achieved after protracted negotiations which only reached fruition last Thursday in Madrid” Last autumn human bones from 105 distinct graves had been uncovered and then removed as part of an archaeological excavation of the cemetery in advance of construction planned for a school on the adjacent property. Local authorities, who supported the construction project, had offered to delivery the bones for reburial elsewhere. There were widespread concerns that removal of the bones elsewhere would establish a precedent for clearing old cemeteries of burials in order to facilitate property development. Most scholars of Jewish law will allow the removal of Jewish remains from a cemetery only in situations of utmost danger to the site and other methods to protect a site have failed. Even then, excavation and removal of remains should be done under rabbinic supervision. Carmel, speaking for the CER, maintained the greatest difficulties were with the local government of Toledo, not with national leaders. “Toledo has a unique place in the history of the Golden Age of the Jews of Spain and the Spanish government understood this and constantly sought to persuade the local government to respect the sanctity of this site,” Carmel said. “Throughout our negotiations with the Toledo authorities, we insisted that these Toledo Jews be buried in exactly the same graves from which they were removed. They intended this site as their eternal resting place and it was our duty to ensure they were reburied according to their wishes,” he added. The reburial of the remains took place yesterday (June 21) and was not widely publicized. According to Carmel the ceremony was, however, attended by local and national government representatives, leaders of the Federation of Jewish Communities in Spain and the president of the CPJCE, Rabbi Elyokim Schlesinger, who personally supervised the burial preparations. Since negotiations ended on Thursday the 18th, the push to rebury on Sunday was presumably taken to avoid any possible challenges or delays to the decision. It also allowed the 87-year-old Rabbi Schlesinger to oversee the reburial, since he was already present as port of the negotiations. Thus, re-burial took place as soon, apparently, after the Sabbath as possible. The result of the negotiations appears to be a victory of sorts for those (including myself) who have advocated for greater recognition of medieval Jewish sites as part of a living tradition, rather than as inert remnants of an extinct culture or civilization. While these sites need to be studied and presented more effectively to the large Jewish and Spanish populations, they need to be treated respectfully, too. Even the most careful archaeology – if it runs counter to Jewish tradition or law – cannot be deemed respectful. Alternative essentially non-invasive means of investigation of cemeteries must be further developed. An important outcome of this settlement is that the site will be marked and maintained as a cemetery – and NOT developed. This should send a strong signal to municipalities and developers throughout Spain that they should not try to usurp cemetery sites. This needs to give further impetus to scholarly efforts to better pinpoint the likely locations of what may be hundreds of Jewish cemeteries throughout Spain. Many of these are not as unknown as one would think – even five hundred years after the Expulsion. They are remembered in toponyms, in land documents, maps and traveller’s accounts, and local legends and lore. Toledo already attracts as many tourists in search of Jewish heritage as any other place in Spain. The remains of two historic synagogues – one of which is now home to the Museo Sefardi – is a strong attraction. Now, the cemetery site can be added to this. Even though there will be little to see (there are no surviving contemporary gravestone in situ – the reminder of Toledo’s “Golden Era” will be strong at the site. According to Carmel: “I hope that our work to save this historic cemetery in Toledo will prove to be a prototype for how governments, local Jewish communities and representative Jewish organizations can work together for the benefit of preserving these cemeteries in Europe." In related news, a few weeks ago the government of Catalonia declared the Jewish cemetery in Barcelona - known as Montjuic - an historic site. I am still collecting details about what this will mean for the future of this cemetery - once on of the largest Jewish burial grounds of Spain. In 2001, 557 graves were excavated there and one gravestone (matzevah) fragment was unearthed. The fate of the remains removed form the graves is unknown to the public. Presumably, there has been adequate time for them to be documented and studied. Arrangements should be made for reburial. The precedent of Toledo should, I hope, speed such action. (ISJM) The Foundation for the Preservation of Jewish Heritage in Poland this past week reported two incidents of vandalism at recently restored Polish Jewish sites. On June 16, 2009, the Jewish cemetery in Gdańsk-Chelm was vandalized by still-unknown attackers, who painted an anti-Semitic slogan in Polish ( "Jews to the oven, for this is your place") on a placard placed at the gate of the newly-renovated cemetery. The local Jewish community reported this case to the Police, and the President of Gdansk, Pawel Adamowicz, expressed his regret in an official letter to the local community. The cemetery has vandalized in the past. In Wroclaw, swastikas and anti-Semitic slogans were painted on the buildings of the White Stork Synagogue, the facade of which has been recently been restored, and Jewish Information Center in Wroclaw. The case is being investigated by the Police. Last January (2009), a ‘Free Palestine’ slogan was painted at the Center’s window in January 2009. The Wroclaw municipality will clean the graffiti, which will cost about 1500 euros. The 87-year old Brantsovsky, still takes visitors to the site to where she escaped when she fled the Vilna Ghetto on 23 September 1943. The history of the Jewish Partisan struggle is told by historian Dov Levin in his book Fighting Back. Lithuanian Jewry’s armed resistance to the Nazis, 1941-1945. (New York and London: Holmes & Meier, 1997). Levin recounts the complex history of the partisan units whose size, location and access to arms ebbed and flowed depending on the demands and pressures of the larger more organized Partisan forces - those directed by the Soviets, and those more nationalist groups. Both groups - whether of the left or right - had little love or repect for Jewish partisans - who needs were often sacrificed for the benefit of the non-Jewish groups (this was not unique to Lithuania). The Jews, of course, with no where else to go but the forest, had little recourse. Still, according to Levin, at least four substantial Jeiwsh fighting groups were created in the Rundninkai Forest, totalling about 400 men. There were Jewish families there, too. Any preservation of the site must make sense of the conflicting claims of the different partisan groups and recognize that the political and ideological complexities the past still continue in many ways today. The “accommodations” at the surviving anti-Nazi Partisan fort were primitive, but the historical significance of the remaining simple dug-out structures and the paths that join them is tremendous. Not only do they represent an important aspect of the anti-Nazi fight in Lithuania – something all Lithuanians should acknowledge – but they also record a momentous movement in Jewish history, comparable to the Uprising in the Warsaw Ghetto, when oppressed Jews chose to fight (sometimes to their death) in the face of overwhelming odds. It is this tradition - an training -of the Holocaust, as much as the suffering and death of Camps (of which Barack Obama has recently spoken), that gave life to the State of Israel in 1948 and afterward. Adalbert Wagner, a volunteer at the Vilna Gaon Jewish State Museum/The Green House has documented the forest site (and has graciously provided pictures for this report). For more photos click here. As an historian, preservationist and a Jew I think it is essential that these remains be protected and preserved. It is not a preposterous goal. Already large sums are being allocated for the preservation of sites of the “Forest Brothers” (many of whom were ex-fascist collaborators and “Jew-shooters” who fled into the forests in 1944 to escape the Soviet advance). This fact should encourage the preservation of this site, too, but in fact the possibility of preserving this site, and teaching its history, aggravates and even enrages those in Lithuania who continue to celebrate the pro-Nazi participants and policies of the war years. Today’s government, while in no way complicit, would rather the whole thing go away. Most likely, like an insurance provider facing a malpractice suit, there are many who are just sitting back and waiting for Faina Brantsovksy to pass away, and her memories to follow. It would be so much better to celebrate Fania’s life, struggle, survival and accomplishments and protect and preserve the Rundninkai Forest fort in her honor, and in the memory of those who lived and fought from there. I call on the Lithuanian government, which has done so much to preserve the memory of Ghetto Jews at the memorials at Panerai (Ponary) and Kaunus’s Ninth Fort, to step forward to protect this simple site, too. I call on the international community, which has done much to assist in the conservation of Auschwitz and the building of memorials at Mauthausen, Belzec, Rumbula, and most recently the Labor Camps of Estonia, and so many other places, to step forward to assist this effort, too. The International Survey of Jewish Monuments is ready to act as facilitator for this project, in the right circumstances. If funds are available, ISJM will assist in putting together an international conservation and interpretation team to work with local professionals and authorities for the long-term protection and preservation of the Rundninkai Forest fort.